I'm not a fan of schmaltzy dramas on TV (or on the big screen for that matter), so even when I heard from friends how good This is Us was, I kept thinking, "Nah, not for me." I did not see one minute of one episode when Season 1 aired on NBC, and I probably would have never watched an episode had this DVD set not become available for review. I'll be honest, I thought this might be the opportunity to knock the series down a few rungs by giving it a fair critique. Now I find myself in the position where I have to admit I was wrong to have skipped it. This is Us is great television, and even though it's intentionally manipulative, it's also fantastically entertaining. However, as anyone who has seen this series will tell you, it's really hard to talk about This is Us without giving away some of its twists and turns. The best of these come at the end of the pilot episode, so if you want to go into this one completely blind (assuming you've managed to avoid news about this show up until now), read no further. I was lucky enough to not know the big twist in the pilot going in, and it made this series' "hook" all that more impactful. So I can't stress enough that it's something you want to avoid if you possibly can. With that fair warning out of the way, the pilot opens with an on-screen message telling the viewer that over 18 million people share the same birthday, but there's no evidence that sharing a birthday links you in any special way with another person. We're then introduced to four other people, all who are celebrating their 36th birthday, and all who seemingly are living very different lives. We are first introduced to Jack (Milo Ventimiglia), who lives in Pittsburgh (this critic's hometown) with his very pregnant wife, Rebecca (Mandy Moore). Rebecca is pregnant with triplets and, sure enough, Jack's birthday turns out to be the day that she's rushed to the delivery room. It's not going to be an easy delivery for her, and things seem to take a turn for the worse when it's discovered that her regular doctor isn't there to do the delivery and they must put their trust in a stranger, Dr. Nathan Katowski (Gerald McRaney). Two of the three babies survive, but the third is stillborn. Randall (Sterling K. Brown) is a stockbroker who seems to have it all at this point in his life. He's doing extremely well for himself financially and has a beautiful wife, Beth (Susan Kelechi Watson), and two wonderful young daughters. But Randall was adopted as a child and never met his real father. The only thing he knows about him is that he dropped off baby Randall in front of a fire station not long after he was born. But Randall's 36th birthday brings him some news. He's been able to track down the whereabouts of his biological father, William (Ron Cephas Jones), and heads off to confront him. Randall hopes to finally be able to tell his dad off, but he winds up inviting him back to his home to stay. Then there's movie star Kevin (Justin Hartley), whose 36th birthday finds him in a career crisis. He's making millions on his hit sitcom, "The Manny", but he's tired of the low-brow plotlines and the fact that he's not taken seriously as an actor. So he decides to quit. But the repercussions for his career could be devastating, when the head of the network tells him if he balks on his contract, he'll do everything in his power to financially ruin Kevin. 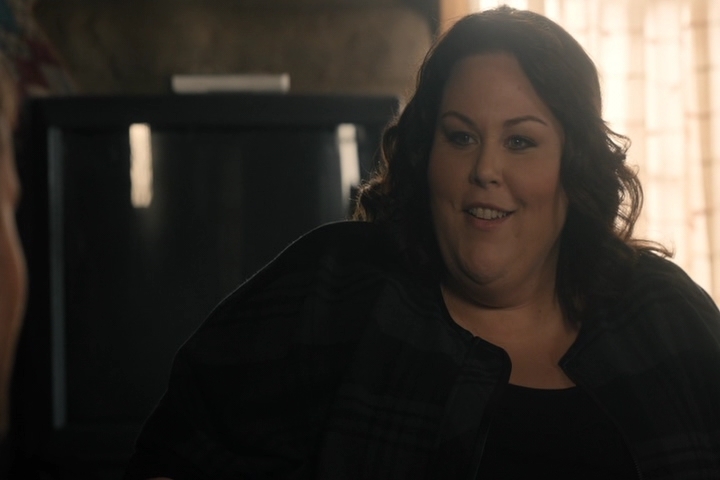 Finally, there's Kate (Chrissy Metz), who is so extremely overweight that it literally has become all she thinks and obsesses about. She's made the step of going to Overeaters Anonymous, and there she meets Toby (Chris Sullivan), a nice guy with a weight problem of his own to deal with. Toby's interested in her romantically, and the two soon become a couple, dealing with both their eating habits and relationship issues in the process. The pilot introduces us to these various characters, all of whom are quite likeable, but none of whom seem to have any connection with one another. Then the showrunners drop the big one on the viewers. When visiting his two new twins in the nursery room of the hospital, Jack meets a firefighter there who is looking in on a young African-American baby he just brought in. The firefighter claims someone just left the child in front of the station. That's when it hits us. The baby in the hospital is Randall as a child, which also means all the scenes with Jack and Rebecca took place 36 years ago. Then Jack and Rebecca decide to adopt the baby, we realize what is going on here. Not only is Randall their adopted son, but the twins that they did have - a boy and a girl - are Kevin and Kate. The characters that were seemingly unconnected throughout the pilot are, in fact, a family. I didn't see it coming, and chances are most others won't either. But the above is just what happens in the pilot, and This is Us has many more interesting places to take these characters as the season progresses. Normally, a "feel good" series like this wouldn't appeal to me - I'm generally the kind of guy who likes things dark, mysterious, and generally ambiguous (one of the reasons Twin Peaks is my all-time favorite show). But the casting here is so good and the characters so likeable, they won me over almost instantaneously. One of the things I admired the most about Season 1 is that there are no real antagonists in this group. Sure, the characters have conflict with each other (as all good dramas do), but everyone here is quite likeable in his/her own way. That's rare for any TV drama, let alone one as appealing as this. The only question now is how long a show like This is Us can last. I fear that in an attempt to up the ante each season, the showrunners will want to keep trying to find new ways to surprise us about these characters and their backgrounds. That might prove to be a mistake and could lead to people starting to lose interest in the series. But for now, This is Us is clearly one of the best dramas airing on the major networks, and I can't recommend it more highly. The first season of This is Us arrives on DVD (sadly, there is no Blu-ray release) in a standard, clear DVD keepcase, with the first four dual-layer discs held on a pair of attached plastic hubs and the final fifth disc on the inside right cover. There are a pair of inserts inside: One an advertisement for the This is Us soundtrack, and the other a special offer from Shutterfly. The first disc in this set is front-loaded with an ad for TV shows from 20th Century Fox available on home video, followed by the trailer for Gifted. The main menu is a montage of footage from the episodes alongside a series of photos of the cast (not too dissimilar from the box cover design), with menu selections across the bottom of the screen. Each episode of This is Us is shot digitally on Arri Alexa equipment and each episode is presented here in its original television aspect ratio of 1.78:1. As DVD presentations go, This is Us leads toward the good side of things. Details are relatively sharp, colors are good, and facial tones remain consistent across the episodes (although the color timing does change depending on what year is being conveyed on screen). Black levels here are just "okay", but about what one would expect for the format. Compression artifacts overall aren't a problem, but I did have a couple of instances of quick glitches in the presentation here and there that were most likely exclusive to my copy and not an overall issue with the pressing (and chances are others may have one or two of these pop up in other spots on their copies). Obviously, there are better methods out there to watch this series (streaming on Hulu or another app comes to mind, as it provides 1080p versions of the episodes), but if DVD is your only option, this release compares favorably with other current TV series available on the format. Each episode features an English 5.1 Dolby Digital track, which provide for a pleasant listening experience, with no noticeable glitches or dropouts. Music plays a big part in the series - not only with composer Siddhartha Khosla's original score, but also with various popular tunes (both past and present) that find their way into each episode. Dialogue is almost exclusively front and center, but there's nice use of the surrounds too. While the episodes never obtain a fully immersive feel to them, there's enough going on in each track to make the audio enjoyable without being overbearing or distracting. In addition to the 5.1 English track, both Spanish and Portuguese 2.0 Dolby Digital tracks are also an option for each episode, as are subtitles in English SDH, Spanish, French and Portuguese. The Aftershow (20:34) - Every episode on this release has an accompanying "Aftershow" segment, which consists of various cast members (and sometimes Creator/Executive Producer Dan Folgelman or Executive Producer Ken Olin) sitting at a table discussing some of the events of said episode. 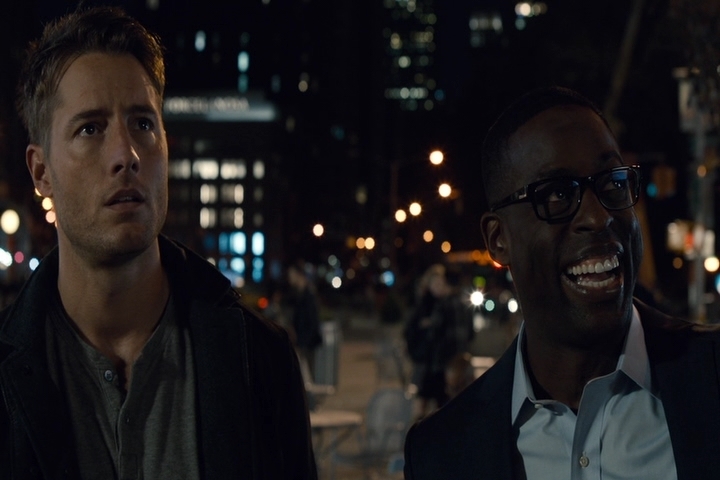 These segments can be watched individually or collectively on each DVD, and this first disc consists of "Aftershow" pieces for the pilot episode (7:40, with Fogelman and stars Sterling K. Brown, Milo Ventimiglia, Chrissy Metz, and Justin Hartley), "The Big Three" (6:24, with Ventimiglia, Metz, and Hartley), and "Kyle" (6:37, with Fogelman, Brown, Ventimiglia, Metz, and Hartley). The Aftershow (23:49) - Disc 2 consists of "Aftershow" pieces for "The Pool" (4:58, with Fogelman, Ventimiglia, Metz, and Hartley), "The Game Plan" (7:14, with Executive Producer Ken Olin, Ventimiglia, Metz, and Chris Sullivan), "Career Days" (5:26, with Olin, Ventimiglia, Metz, and Sullivan), and "The Best Washing Machine in the World" (6:21, with Olin, Ventimiglia, Metz, and Sullivan). The Aftershow (29:53) - Disc 3 consists of "Aftershow" pieces for "Pilgrim Rick" (7:57, with Olin, Ventimiglia, Metz, and Sullivan), "The Trip" (7:14, with Fogelman, Ventimiglia, Metz, Mandy Moore, and Susan Kelechi Watson), "Last Christmas" (7:20, with Fogelman, Ventimiglia, Metz, Moore, and Watson), and "The Right Thing to Do" (8:43, with Fogelman, Ventimiglia, Metz, Moore, and Watson). The Aftershow (26:46) - Disc 4 consists of "Aftershow" pieces for "The Big Day" (6:27, with Fogelman, Ventimiglia, Metz, and Hartley), "Three Sentences" (5:39, with Olin, Metz, and Hartley), "I Call Marriage" (6:50, with Olin, Metz, and Hartley), and "Jack Pearson's Son" (8:01, with Ventimiglia and Moore). The Aftershow (49:33) - Disc 5 consists of "Aftershow" pieces for "Memphis" (7:22, with Brown and Ron Cephas Jones), "What Now?" (5:15, with Ventimiglia and Moore), and the season finale "Moonshadow" (37:04, with the entire main cast (minus Sterling K. Brown) on stage in front of a live audience). This is Us may try to intentionally manipulate its audience by pulling at their heartstrings in almost every episode, but the casting here is so perfect and the acting so good, it's hard not to fall in love with this series. If a cold-hearted critic like me enjoyed this, you probably will too. Highly Recommended.